Prep for this Hearty Cabbage Soup Recipe in under ten minutes and cook it in under an hour. You'll be hard pressed to believe that a recipe so simple is so scrumptious. 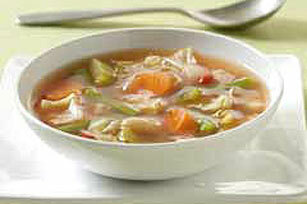 Try our Hearty Cabbage Soup Recipe for an easy but unforgettable dish. Combine ingredients in Dutch oven. Bring to boil on high heat; simmer on medium-low 30 min. or until vegetables are tender, stirring occasionally. This soup freezes well. Prepare as directed; cool completely. Ladle into 1-qt. freezer containers and freeze up to 3 months. Thaw in refrigerator before heating to serve. You'll savor the flavor of this satisfying fat-free soup. As a bonus, the vegetables team up to provide a good source of both dietary fiber and vitamin A.